I am not saying I have found “success” yet. But I am certain of what I love and what I want. And because I have this space (my tiny corner of the internet), I have been able to find my voice in cooking. To me, nothing could be better than spending a whole day at home watching bread rise, or cooking a ten dish Thanksgiving dinner solo. These things feed my spirit! 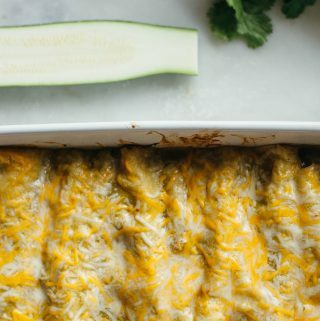 This Zucchini Enchilada recipe is one I’ve been making for years and never thought to post it. I make them all the time especially when I have company because I can always stretch this dish to feed more people miraculously. Sometimes if don’t drench them in sauce and go a little light on filling, you can make 16-18 enchiladas. Which is pretty good! Just cook some rice with it and you have a meal. 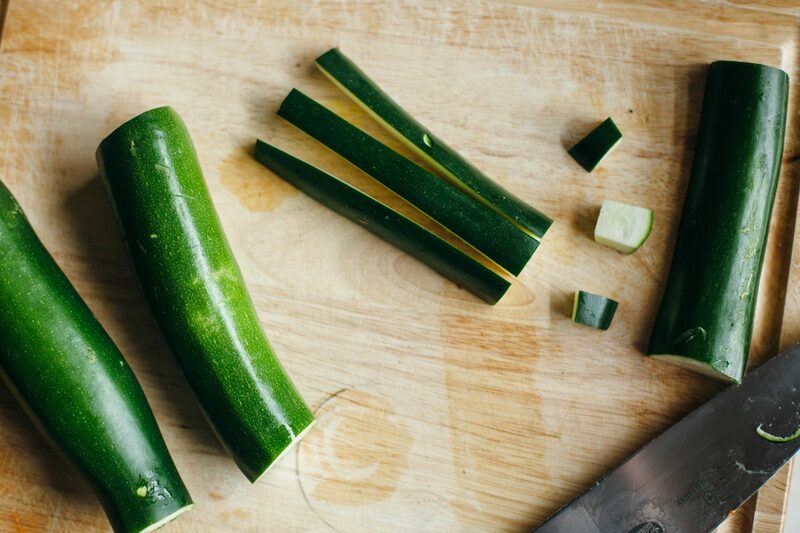 Cut the ends off the zucchini. Then cut in half lengthwise. Place the zucchini halves flat side down. Cut longways into three long pieces. Holding them together, dice them by cutting the zucchini crosswise. Repeat with remaining zucchini. Dice your onion. Dice your cilantro stems and chop the leaves. Drain the black beans. In a large nonstick or cast iron skillet, throw in your olive oil over medium to medium high heat. Add the onion and cilantro stems, and saute for 3-4 minutes. Add the zucchini and the cumin, oregano, salt and paprika. Cook, stirring frequently until zucchini is softened and more translucent. 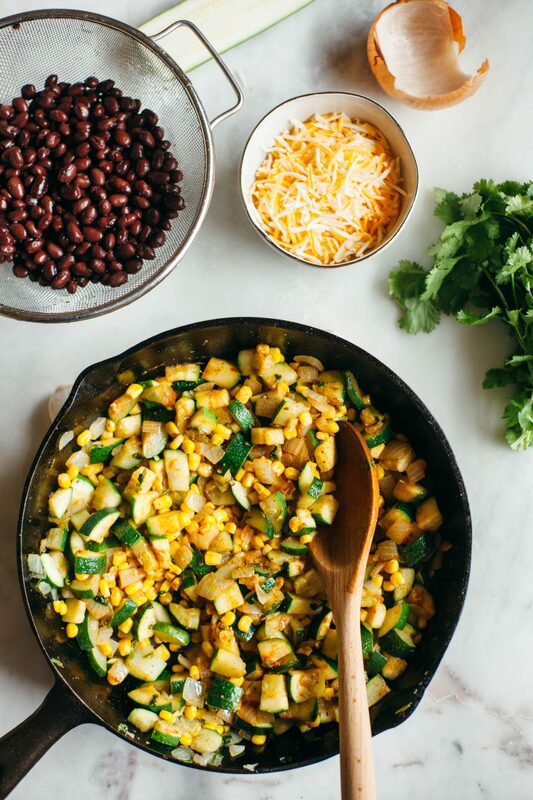 Add the corn and black beans. Add just a small splash of the enchilada sauce (maybe 1/4 cup?). Then stir together and once everything is warmed, remove from the heat. Now to heat your tortillas. Buy good tortillas! Mine were crappy and I had to heat them twice to keep from falling apart. Mission is a good brand. If you bought the good tortillas, you can place the tortillas on a plate, get a damp paper towel, cover the tortillas with it, and microwave for 30 seconds. If they still fall apart when you fill them, heat them in a pan or on a gas burner to give them a little more resolve. Pour a very very thin layer of enchilada sauce in the bottom of your pan. Carefully, put a tortilla in your hand. Spoon 3 tablespoons of filling into the tortilla and roll it over, placing it seam side down in your prepared dish. Repeat with the remaining tortillas and filling. If you have leftover filling and tortillas, then prep another pan and continue rolling until you’re out. Pour the enchilada sauce all over the enchiladas, sparingly at first to make sure you cover everything you need. If you’re running low, use a spoon to make sure all the tortillas are covered and kind of spread it around. Then sprinkle the cheese on top. Cover the pan with aluminum foil and bake at 425 F for 15 minutes. Then remove the foil and bake another 5 minutes. Remove from heat and serve. In a large nonstick or cast iron skillet, add the olive oil over medium high heat. Add the onion and cilantro stems, and cook for 3-4 mins. Add the zucchini, and cook until the zucchini is softened and slightly tranaslucent. Add the cumin, paprika, salt, and oregano. Stir to coat. Add the black beans and corn. Add about ¼ cup of enchilada sauce to the mixture. Cook, stirring for two minutes. Remove from heat. 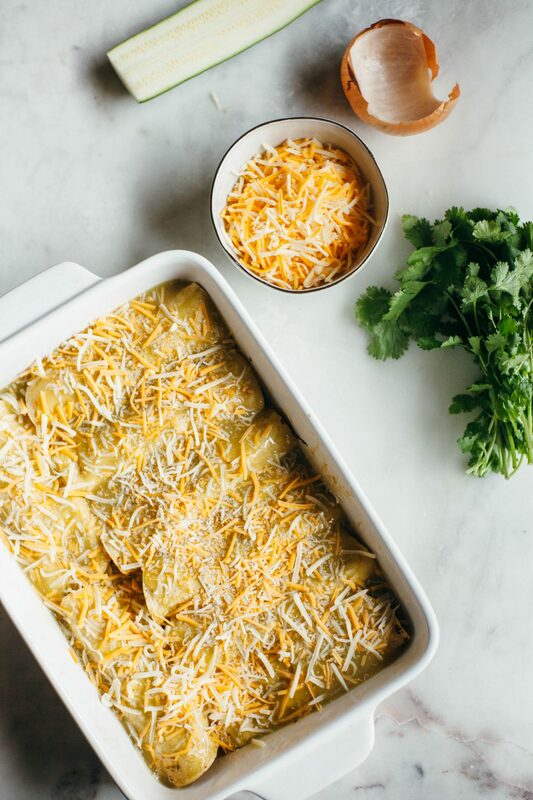 In a large 9x14 dish, add a very thin layer of enchilada sauce (only a couple tablespoons). Coat the bottom by moving the pan side to side. Heat the tortillas. Place them on a plate and cover them in a damp paper towel. Heat in the microwave for 30 seconds. With a tortilla in your hand, add 3 tablespoons of the filling. Carefully roll and place seam side down in the pan. Repeat with the remaining tortillas. 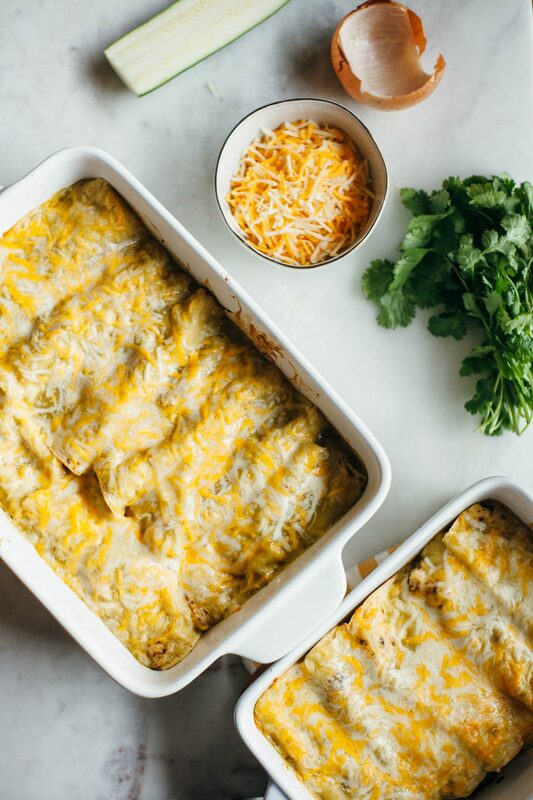 Pour all the remaining enchilada sauce over all the enchiladas. 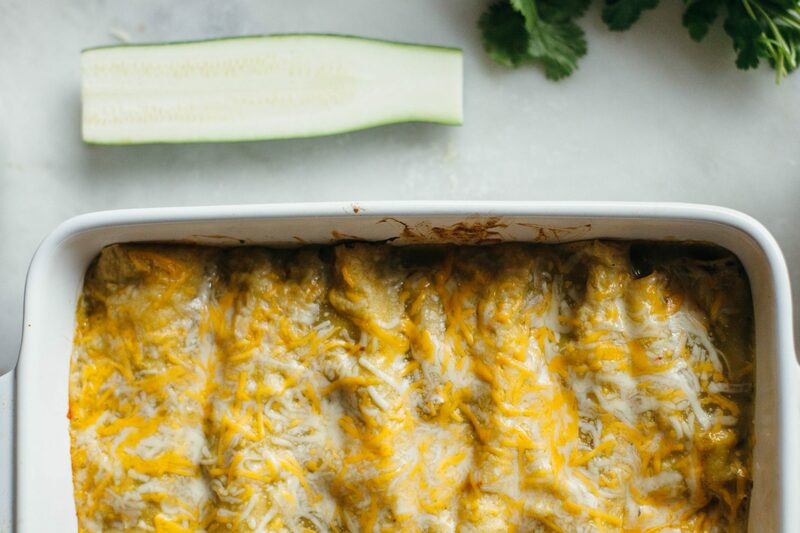 Sprinkle the cheese on all the enchiladas. Cover in aluminum foil and bake for 15 minutes. Remove the foil and bake an additional five minutes. Serve hot.